Merlin has left this world. When I moved to the UK in 1998 to live with Richard, I endured three months without a pet (the first time in my life without an animal) before we finally decided to adopt a cat. Merlin would be Richard’s first pet. 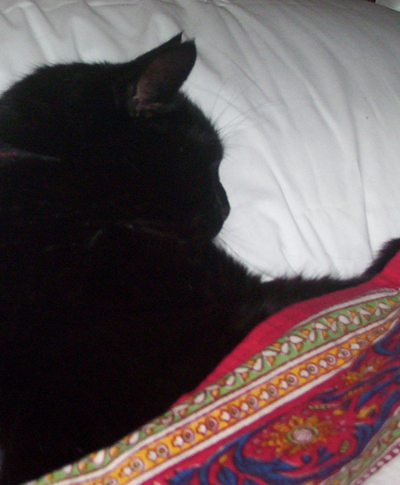 I had always wanted a black cat and had reams of Arthurian and Celtic names lined up. In my family we always adopted animals from animal shelters, so I knew not to expect the exactly the criteria I was looking for – I would happily compromise on my ultimate cat because of the overwhelming desire to give a loving home to a cat who needed it. Any cat, not matter what age, colour or temperament would have been ok and I knew it was likely that we would come with a cat that day. We walked into the cat home in Bedfordshire where there were lots of other hopeful adopters – and I probably gasped out loud. There in a cage, sad a beautiful proud black cat called, 3 years old called Merlin. I could not believe it! My heart was pounding as I was convinced that other people in the room were about to adopt him and I would miss him by a whisker. I was whispering to Richard “this one, this one” and Richard was of course browsing around at the other cats. I knew Merlin was for us, but didn’t want to draw attention to him, fearful that the families hovering around would see how warm and friendly this mass of shiny black fur was. I hoped Merlin had some sort of cloak of invisibility so that I was the only one who could see him. I think Richard went up to the cage, and Merlin nuzzled his finger. This was the winning act of communication and Richard was hooked too. I knew Merlin was for us and it became apparent that most people in the room were after younger kittens anyway – my heart didn’t stop pounding until we signed the adoption papers – he was ours – perfect age, perfect colour, perfect name. That was the start of our life with Merlin. He moved with us from Bedfordshire, to a rented cottage in Lancashire, then again to our cottage in an idyllic little hamlet in Lancashire where he had the most amazing life – chasing trout in the stream, leaving catprints in the snow, curling up by the open fire in winter, lazing in the sun in the stone circle on a warm summer day, stalking rabbits in the green grassy fields – he was such an adventurer. He had the devotion of a dog and would sit by our sides in the garden and follow us everywhere. In an epic show of ultimate cat love, when we moved to Australia, Merlin came too, at great cost and endured two more house moves until he finally had his own farm. He was the king of calm and could handle anything life threw at him, adaptable and sweet with it, always offering up a wet nose when you needed an emotional lift, or a comedy leap if you needed a giggle. He was a classy cat even though there was nothing remotely pedigree about him. He was incredibly affectionate and a champion mouser – although sometimes he went a little too far and once brought a mole into the house. At this point Merlin got given one of his only rules – we came to an agreement that Wind in the Willows creatures were absolutely not to be killed. About a year ago, age started to catch up with Merlin and he began to decline. There was always a bit of cheeky Merlyness around, but it was fading as his body started to get weary and battle with his spirit. A year ago we had a conversation with the vet as his kidneys were not good, and he rallied over the winter in 2007 and seemed stronger. However, this summer came and more recently this terrible heatwave and he became even worse, his back legs started to give, he could not cope with infections and he has been deterioating in body and spirit. It got the point where it was clear that Merlin was no longer happy on this earth. We made the dreaded appointment that we knew he would not return from after 10 years with us and 13 years of life on earth. There is a beautiful book called The Wild Road by Gabriel King that every cat lover should read. In fact, I think I’m going to read it again soon. That’s where I like to think Merlin is. On the Wild Road with all the other cat spirits.